I was asked by a cousin if I could make him a cake for New Year's. I enjoy making the odd cake here and there, however my decorating skills are very amateurish and the idea of making a cake that people outside my immediate family would see was to be honest a little daunting. 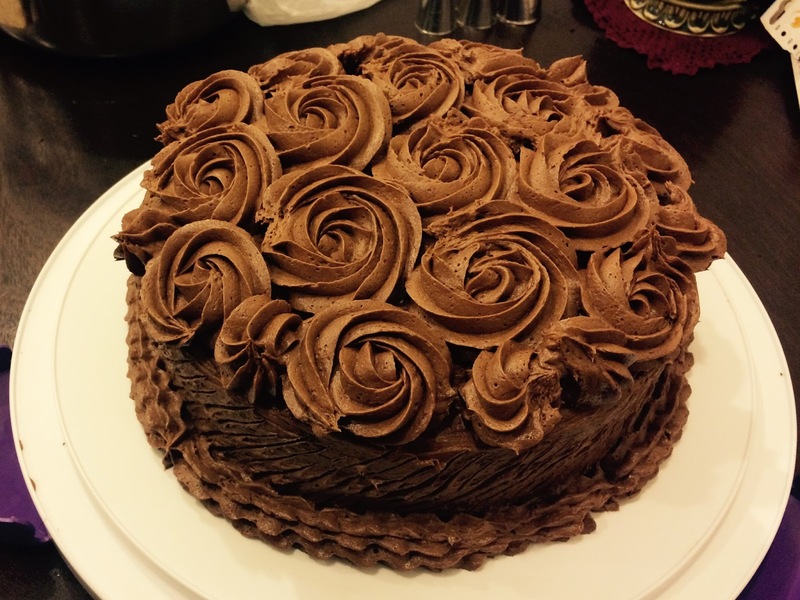 I started frantically scouring the web for chocolate cake recipes (because everyone loves chocolate) and found this cake from My Baking Addiction aptly named "The Best Chocolate Cake". With a name like that, how could I resist? I love two step recipes where there's no creaming, folding, or any other nonsense involved and all the dry ingredients are dumped in together followed by the wet ingredients. I didn't have the black cocoa mentioned in the recipe and so I just added a little extra regular cocoa. I also didn't have kosher salt and made do with table salt. Verdict? The cake was heavenly and absolutely moreish. It was moist, rich and had that beautiful deep chocolate flavor without being overly sweet. I loved the addition of the strong coffee and believe that is what intensified the chocolate flavour. The only thing I would change is the frosting suggested for the cake as it was quite airy and soft and not quite suitable for piping. This cake has officially been added to my family's list of favourites and I'll definitely be making it again! Haha, I made one for myself too and it was absolutely delicious!